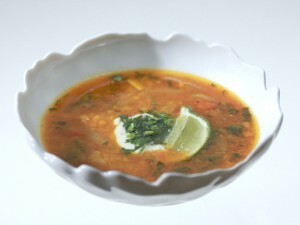 Lentil Soup With Herbs And Lemon recipe by Nazia Nazar at PakiRecipes.com. This is a simple, delicious and nutritious soup. Soaking the lentils overnight helps them cook very quickly. The preparation time is under 10 minutes and the cooking time is about 20 minutes. Bring the lentils to a boil in the broth. Reduce the heat and simmer until tender, approximately 15 minutes (if you have not presoaked the lentils, increase your cooking time by about 15 more minutes). While the lentils are cooking, saut the onions in oil for 8 minutes or until they are golden brown. Remove from heat and set aside. When the lentils are tender, add the onions, herbs, salt and pepper.